A detailed history of a vitally important year in Alabama history. The year 1865 is critically important to an accurate understanding of Alabama’s present. 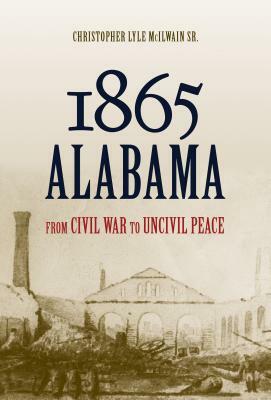 In 1865 Alabama: From Civil War to Uncivil Peace Christopher Lyle McIlwain Sr. examines the end of the Civil War and the early days of Reconstruction in the state and details what he interprets as strategic failures of Alabama’s political leadership. The actions, and inactions, of Alabamians during those twelve months caused many self-inflicted wounds that haunted them for the next century. McIlwain recounts a history of missed opportunities that had substantial and reverberating consequences. He focuses on four factors: the immediate and unconditional emancipation of the slaves, the destruction of Alabama’s remaining industrial economy, significant broadening of northern support for suffrage rights for the freedmen, and an acute and lengthy postwar shortage of investment capital. Each element proves critically important in understanding how present-day Alabama was forged. Relevant events outside Alabama are woven into the narrative, including McIlwain’s controversial argument regarding the effect of Lincoln’s assassination. Most historians assume that Lincoln favored black suffrage and that he would have led the fight to impose that on the South. But he made it clear to his cabinet members that granting suffrage rights was a matter to be decided by the southern states, not the federal government. Thus, according to McIlwain, if Lincoln had lived, black suffrage would not have been the issue it became in Alabama. McIlwain provides a sifting analysis of what really happened in Alabama in 1865 and why it happened—debunking in the process the myth that Alabama’s problems were unnecessarily brought on by the North. The overarching theme demonstrates that Alabama’s postwar problems were of its own making. They would have been quite avoidable, he argues, if Alabama’s political leadership had been savvier. Christopher Lyle McIlwain Sr. is an attorney in Tuscaloosa, Alabama, who has spent the last twenty-five years researching nineteenth-century Alabama, focusing particularly on law, politics, and the Civil War. He is the author of Civil War Alabama. "Broader contextual issues aside, 1865 Alabama unequivocally demands to be taken seriously as a landmark in Alabama’s historical scholarship. The book is a thoroughly researched, artfully presented, and timely edition to the state’s historiographical record. The era of its focus is one of the least trod historical grounds in Alabama’s rich history, and McIlwain currently stands among the leaders in its interpretation. Anyone wanting to know about Alabama’s Civil War and Reconstruction experience must reckon with this book." "Clearly, the first months of 'peace' in Alabama, McIlwain concludes, set the tone for the state's economic, political, and social evolution even to the present day. Judging from the convincing arguments herein presented, this lawyer has won his case."